Where Did the Water in the Spent Fuel Pools Go? Since early in the current crisis—a few days after the earthquake and tsunami damaged the reactors at the Fukushima Dai-Ichi facility—people have been concerned about lack of water in the spent fuel pools at the reactors. The water is needed to cool the spent fuel rods, which continue to generate significant heat for years after being removed from the reactor core due to their radioactivity. Each of the six reactor units at Fukushima has its own spent fuel pool. These pools are about 12 meters deep. The spent fuel occupies roughly the bottom 4 meters of the pool and the surface of the water is typically about 7 meters above the top of the rods. In normal operation, electric pumps continually circulate the water in the pool, pulling out heated water, which is then cooled and sent back into the pool. Unlike the cooling systems for the reactor core, the pumps for these pools typically don’t have backup power, so once electricity from the power grid was cut off, the pumps stopped operating. Once that happened, the heat from the fuel rods began raising the temperature of the water in the pools. Once the water in a pool reached the boiling point, it would begin to boil away and lower the level of the water. As long as the water, even though boiling, continues to cover the fuel rods it protects them from damage. But once it drops far enough to expose a meter or so of the rods, the exposed sections can become hot enough to damage the cladding on the rods and release radioactive gases. If the fuel continues to heat up, the cladding can begin to burn, which produces hydrogen. If enough hydrogen collects above the pool, it can explode. The earthquake took place on the afternoon of Friday, March 11. Four days later, on Tuesday, March 15, press reports of a fire in the Unit 4 spent fuel pool and hydrogen released from the spent fuel rods suggested that water had dropped well below the top of the fuel rods in the Unit 4 pool. The next day, Wednesday, March 16, there was enough concern about lack of water in some of the spent fuel pools that workers began trying to drop water into them from helicopters and spray water from fire hoses. These remote efforts to add water were necessary because of the high radiation levels around the pools, which is additional evidence for the loss of water from the spent fuel pools. The water, in addition to cooling the fuel rods, also shields against the radioactivity being emitted from the fuel. As the water levels in the fuel pools dropped, the radiation levels around them increased and workers could not get close to them. 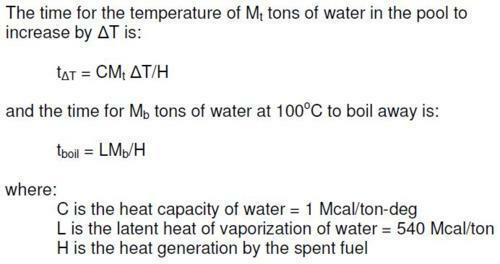 Since Japan has reported the level of heat generated by the spent fuel in the pools, we can estimate how long it would take for the water in the pools to boil off and begin to expose the fuel, assuming there were no leaks. These estimates show that the time required to boil off water is too long to account for very low water levels and exposed fuel in the pools by March 16, assuming the cooling systems in the pools were working correctly before the earthquake struck. The calculation assumes that cooling of the pools stopped at the time of the earthquake and tsunami, and at that point the spent fuel pools were filled with water at 20 degrees C (with the amounts given in the table below). Column 5 in the table shows the time it would take for that amount of water to be heated to boiling temperature (see the end of the post for details). Data on the pools is from here. All the pools are reported to be about 12 meters deep. The pools at Units 2, 3, 4, and 5 all have dimensions of 12.2m x 9.9m x 11.8m deep. The fuel assemblies are about 4 meters long. They sit on racks in the pool, slightly off the pool’s floor. If the pools are filled with water there would be about 7 meters of water above the top of the fuel assemblies, which corresponds to the amount of water given in column 6 of the table. Once the water in the pool has been heated to boiling, column 7 gives the additional time required for boiling to cause the water level to drop to the top of the fuel assemblies, just covering them. Press reports state that the water in the pool at Unit 4 was thought to be approaching the boiling point late on March 14, three days after the earthquake. This roughly agrees with these estimates, but it is not clear what information those reports on based on. If correct, this information suggests the water level in this pool had not dropped significantly by this time, since otherwise the smaller amount of water would have heated more quickly. Reports also said that workers began taking initial steps on March 15 to cool the water in the pools at Units 5 and 6, and that by March 17 temperatures were still rising, reaching between 60 and 70 degrees C. This is also roughly consistent with the numbers in the table, assuming these pools were full of water. By March 19, cooling at both pools 5 and 6 appeared to be working to bring the temperatures down. But the times in the table indicate that boiling of the water in the pools would take much too long to account for the low water levels and exposed fuel reported at the spent fuel pools in Units 2, 3, and 4. So something else must have caused the low water levels. One cause of low water levels may have been that water splashed from the pools during the earthquake. I haven’t seen reports suggesting significant water loss by splashing or that the water levels in the pools were low shortly after the earthquake. Also, as noted above, the reported rate of heating of the pools at Units 4, 5, and 6 suggests that the water level was not significantly reduced early on. Moreover, except in the case of the Unit 4 pool, even if the water levels in the pools had dropped by several meters during the earthquake—corresponding to hundreds of tons of water being spilled—the heating and boiling times to expose the fuel would still be too long to account for very low water levels in the pools. A second possible cause of the low water levels is that the pools at Units 2, 3, and 4 all developed significant leaks. Some reports said that a leak was suspected in the pool of Unit 4 and possibly in Unit 3. This analysis suggests that all three pools may be developed leaks. Dave Lochbaum has suggested a common failure mode for leaks in the spent fuel pools. Large doors in the side of the pools are equipped with rubber tubes that are inflated to seal around the door. Even if these seals were not damaged, without power to run the pumps that keep the seals inflated, they can lose air over time and create leaks around the door. Such leaks may not show up immediately since it could take some time for the seals to lose air pressure. The pumps for these seals currently do not have backup power so leaks of this kind can result from an extended loss of power from the grid. This is a vulnerability of this type of plant design that could happen elsewhere, including at a number of plants in the the US, and needs to be addressed.